1 Night Only – September 27 at 8 pm. Belushi starred on the ABC hit comedy “According to Jim,” on which he also served as executive producer, music composer and director. After wrapping 182 episodes for its eighth and final season, the family favorite series also hit a milestone when it launched into off-net syndication in 2007. A favorite of film, television and stage audiences, Belushi is one of the great leading character actors equally at home in drama and comedy, and a gifted performer who can also hold a room as front man of a rhythm and blues band. Accompanying Belushi are Megan Grano, Larry Joe Campbell, Brad Morris, and Joshua Funk*, all of whom are classically trained professional improvisers who tour regularly nationwide. Those who’ve been to The Bretts Show this year have seen the new music group, Prince Ivan (Brydon and Garon Brett, with their friend Aaron Ellsworth) in action. This up and coming band is creating original top 40-worthy music for all to enjoy. 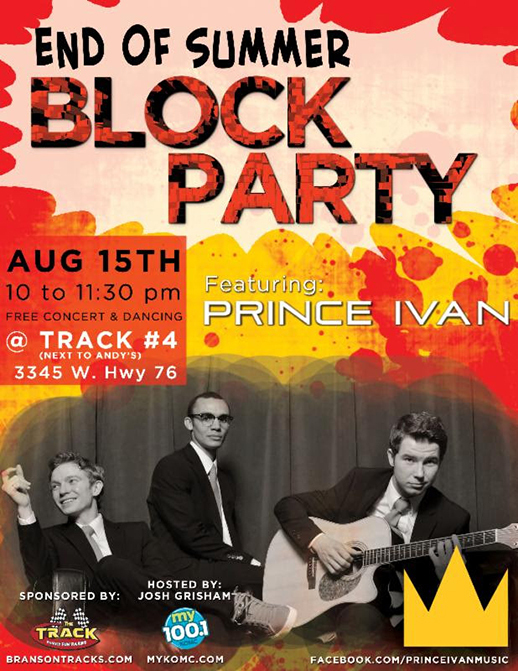 On August 15th at 10:00 p.m. they will team up with The Track Family Fun Parks and My 100.1 KOMC for an incredible community event – the first annual Branson End of Summer Block Party, featuring a free concert from Prince Ivan and dance party provided by My 100.1 KOMC. All (tourists, visitors and Ozarks residents) are invited to this fun, family-friendly and FREE community event. So bring your friends and family and get ready to dance with Prince Ivan! Like Prince Ivan’s Facebook page right here Prince Ivan Music and make sure you join the FB event page right here Block Party Event Page. See you at the party!